Many fans find this a difficult story to comprehend. Certainly, back in 1981, it left me scratching my head in puzzlement. However, it’s a story that improves over time and perhaps needs the benefit of age and wisdom to understand it. How many kids really appreciated this at the time, I wonder? It seemed willfully obscure to me as a 17 year old and received wisdom often continues to trot out this line. As a story it’s actually very linear and easy to understand. It’s the telling of the story that’s so very different here. It’s book-ended by two very traditional Doctor Who productions and it stands out like a sore thumb. But what a sore thumb. It’s amazing that this got to our screens in this form as even for 1981 it defied expectations and conventions. It’s atypical and joins a number of the oddest serials under the Doctor Who banner – odd perhaps for their surreal vision or their puzzlebox narratives – and mimics some of the visual and narrative games that film directors such as Nicolas Roeg employed on films like Don’t Look Now or writers such as David Rudkin had attempted with Penda’s Fen or even more pertinently in 1981’s Artemis ‘81. Oh, and chuck in some Rosencrantz And Guildenstern too for good measure. 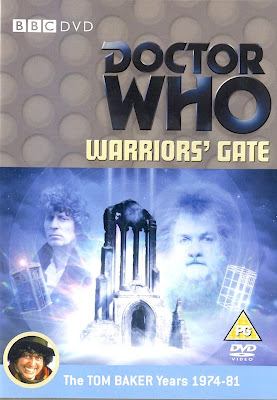 Warriors’ Gate isn’t deliberately obscure and the story is presented quite clearly – The Doctor, Romana, Adric and K9 arrive at the Gateway, an intersection between E-Space and N-Space, where the time-lines converge. They are not alone in this slowly shrinking void. The Privateer and its crew, led by Rorvik, are also trapped here with their cargo of time-sensitive Tharils. Slave traders, they use the Tharils and their powers to navigate through space. The Tharils were once the rulers of a vast empire and were slave traders themselves until their slaves revolted using the Gundan robots to hunt them down. Now, seeing the error of their ways, one of the Tharils uses the Doctor to help free the remaining slaves. As the void diminishes, a race against time begins to prevent the Privateer and its crew from destroying the Gateway, helping the Tharils to escape enslavement and get the TARDIS back into E-Space. There. That’s fairly straight forward. However, how this information reaches you isn’t all plain-sailing. Warriors’ Gate must be one of the most televisual and tele-literate serials in the canon. It takes Nathan-Turner’s remit to modernise the show using new technologies and new ways of telling the narrative and runs with it. It’s a cross between Play For Today, Jean Cocteau’s Orphee, a number of highly stylised pop videos of the era (everything from ‘Ashes To Ashes’ ‘Stand And Deliver’ to ‘Fade To Grey’) and Last Year At Marienbad. Willfully eclectic visually, then. Only the minimum is imparted through dialogue and direct exposition and when a dramatic point is made visually it’s done with a real appreciation of what can be achieved by 625 line cameras in TC1 at Television Centre and thoroughly disassembles the ‘television as theatre’ thinking that was the way television was made up until the 1980s. This is television being television. 100%. Arguably much of the sense of Warriors’ Gate is visual and symbolic and a lot of it doesn’t necessarily point you in any right direction or give you clues. Images are used to inform the whole in an exercise similar to trying to build sandcastles whilst the tide is coming in. The overwhelming sense of the visuals in Warriors’ Gate underpin the themes of chance, random actions and indeed, no action at all. ‘Do nothing’ but ‘ the right kind of nothing’ sums up the feeling of inevitability in the story. The many strands of the plot converge, must converge, despite the actions and in-actions of the characters trying to change this course, and cause, of the discourse. The still point of the climax of the story is our destination and will always be there. With a pragmatic fatalism, the Doctor understands finally that the inevitable will be the destruction of the Gateway and the Privateer, will be Romana’s decision to remain behind with the Tharils. And the stillness is there all around us, from the brilliant slow tracking shot around the Privateer in the opening of episode one, to the white void outside and then the frozen gardens of the Tharils' palace. The Tharils come over as repentant nobles maintaining a very faded empire and there’s that sense of inevitability in Biroc’s evocation of times past, a frozen empire awaiting re-emergence. Biroc and the Doctor are pretty much the two sides of the coin that’s featured here – Biroc foresees the events of the story and manipulates the other characters towards the events of the final episode. No randomness, no chance involved. The Doctor here is very much the instigator of random action – hence his allusion to the I Ching - and finds it wanting and is left to ineffectual bewilderment. And Biroc can also see that if the Doctor interferes randomly with actions then the whole ‘do nothing’ approach will be for nothing! The whole point of the story is Romana’s decision to remain with Biroc and free the other enslaved Tharils across the Universe and all the narrative and visual turns are the gears that move us to this conclusion. It’s superbly directed by Joyce and certainly has some very memorable cliffhangers to episode one and two, all well edited and constructed - the Gundan robots about to slice off the Doctor’s head and the escaped Tharil creeping up on a trapped Romana. The complex switch between the past and the present in the Gateway is handled well and boasts some good production values. The casual knocking over of the goblet of wine is a superb visual motif that transports us between worlds and times and leads into the double-take conclusion of episode three. It’s meticulously planned, supported by great design from Graeme Story and a memorable score from Peter Howell who has now learned not to smother the visuals with squealing synthesisers. Visual effects are very good here with the model work some of the best the series has offered, contributing to the whole atmosphere. Baker and Ward are on exceptional form. Ward in particular gets a good swansong and her farewell, though brief, is sympathetic and heartfelt and very appropriate. Baker manages to get across the Doctor’s incapacity to deal with the events at the Gateway – a mixture of bewilderment, frustration and resignation. Adric and K9 are less intrinsic to the plot here and are rather overshadowed by the leads and the guest cast. That K9 ceases to function in the void and can only be restored the other side of the mirrors is perhaps an apt conclusion to the character’s usefulness in the series. He heroically lives on despite no longer being in the series, something that has been of increasing significance since the start of the season. So it’s goodbye to Romana and K9 – another door closing on the Baker era – and it’s the concluding story of the E-Space trilogy. It’s a literate piece of SF, thoroughly embracing the way television worked at the time, feeling part of the zeitgeist and bringing to the fore Bidmead’s desire for a harder edged quality to the series. An undoubted highlight of the season, visually impressive and intelligently constructed. Commentary with actors Lalla Ward and John Leeson, director Paul Joyce, script editor Christopher H Bidmead and visual effects designer Mat Irvine. The Dreaming – cast and crew look back at the troubled making of this story. The Boy with the Golden Star – actor Matthew Waterhouse looks back on his time on the show. Lalla's Wardrobe – a trip through Romana's time on the show via the medium of the many costumes actress Lalla Ward wore along the way. It’s a one-off Frockumentary like you’ve never seen before. Extended and Deleted Scenes – missing scenes from an earlier edit of ep. two. Continuity – BBC1 continuity announcements from the original transmission. Photo Gallery, Isolated Score, Easter Egg – Mat Irvine talks about the Gundan axes and his own on-screen role in Warriors' Gate, Coming Soon Trailer, PDF Material, Programme Subtitles, Production Notes. "it’s a story that improves over time and perhaps needs the benefit of age and wisdom to understand it. How many kids really appreciated this at the time, I wonder?" which is incredibly patronising, I would have enjoyed your article with a round of indulgent hearty chuckles. What I like very much here is the distance between your commentary and the object. Your article is a closed system unto itself, an essay from E-Space, genuine science fiction - something I haven't come across since the early 90s. Warrior's Gate of all things, my God. Now who is being so patronising? Um, that was deliberate as in a joke at my own expense - because I'm just another schmo at the end of the day, my comments have no special authority and i don't take myself all that seriously. Guess I was feeling a bit vulnerable that day. Prone to it occasionally. I don't take myself all that seriously, either. So let's both not take ourselves seriously because I do really welcome your intelligent comments. I just wasn't quite sure which place the one on 'Warriors' Gate' was coming from. My bad. And I wasn't really trying to patronise anyone with the comment about kids not understanding the story. I was one of those kids so it was a bit of self-deprecation! It's only now as a raddled 46 year old that I can get my grey matter round it. Thank you for your article, Frank! Having watched this story again recently I am amazed by how good it actually looks. As a wee kid there is absolutely no way I would/could have understood its complexity. But now, as an adult, I can fully appreciate Warriors' Gate. And I can understand the part about benefit of age and wisdom. Well, thank you Phil. I'm glad you enjoyed that. Lots more to come. Next up is the Master trilogy of 'Keeper Of Traken', 'Logopolis' and 'Castrovalva'. Thanks for following too! Welcome aboard. Hello Frank, just stumbled in and read my own obnoxious comments. Believe me i feel suitably ashamed and apologetic.